Earl Folken, 91, of Schuyler, died Saturday, May 26, 2018, at the Schuyler Care and Rehabilitation Center in Schuyler. 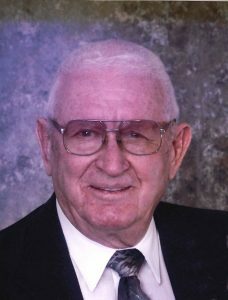 Funeral Service Friday, June, 1, 2018 10:30 A.M.
Earl John Folken, was born March 20, 1927, to John and Leona (Henke) Folken on a farm Northeast of Richland, NE. He was baptized on April 24, 1927, at Immanuel Lutheran Church Missouri Synod, Northwest of Schuyler. He also attended grade school and was confirmed there on March 17, 1940. He then attended Schuyler High School. Earl served 14 months in the US Army from February 1946 to March 1947. On April 26, 1949, he married Geraldine Muhle at St. Johns Lutheran Church, Shell Creek, NE. They farmed Northeast of Richland until December 1981 when they moved to their home in Schuyler, NE. Earl drove a feed truck for Don’s Feed for 1 ½ years before working as a maintainer operator for Colfax County from February 1984 to April 1989. He served as Colfax County Commissioner for 8 years from 1991 through 1998 after which he retired.
. He is survived by one son Ricky (Cathy) Folken of Columbus and one daughter Julie (Roger) Cerny of rural Richland, 5 Grandchildren; Kathy (Nate) Bach, Kristopher (Tonya) Folken, Channing (Cole) Reha, Sandy (Pat) Lotspeich, Sr., and Jody Sladek, and 14 Great Grandchildren and 13 Great Great Grandchildren. He was preceded in death by his parents, brother Ivan Folken, and wife Geraldine on March 19, 2006.